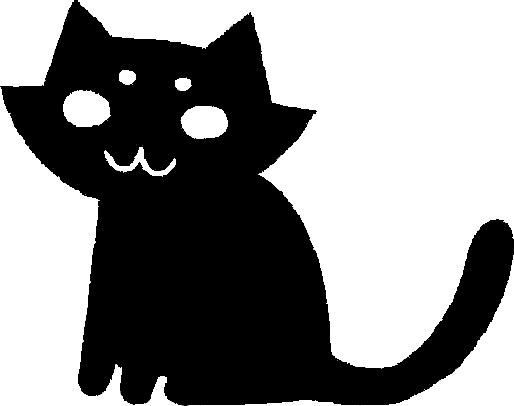 Short Character Description: A lean and dark grey cat with yellow eyes. Unsurprisingly, Bentfoot's most prominent feature is his front right foot, which is twisted unnaturally. This gives him a heavy limp where previously his gait was incredibly smooth and graceful, and slows his movement pace down considerably. His only other notable deformity is that his long tail is crooked. Besides this, Bentfoot can be considered quite attractive. His fur is dark grey, extremely close to black, with the faintest of stripes lining his back and sides. Although he isn't the most fit of cats, he is thin, body practically composed of sharp angles. His face is long and angular, and, combined with his long whiskers and bright orange eyes, makes him rather handsome. His other most notable quality is his voice. Although he can easily speak loudly enough to be easily heard by all the clans at a Gathering, during normal conversations his voice is extremely quiet. His voice is as cultured as a clan cat's can be, and it flows quite smoothly. He keeps his tone relatively smooth, although definitely not a monotone. When he gets agitated his voice rises in pitch, but that rarely happens. Bentfoot is known for being one cool customer. He can keep a clear head under even the most stressful conditions, and stays calm no matter what the circumstances. When he was younger it was possible to get him emotional if he was bothered enough, but Bentfoot has only continued to mellow even more as he ages. Due to this, he rarely expresses emotions besides a quiet happiness and maybe the slightest bit of annoyance, and spends the rest of the time dead serious. Very little fazes him, even the most disgusting or frightening things. How did you find COTN? : My roleplaying senses guided me here. Ivykit was born in a litter of four, with the brothers Shadekit and Sootkit and the sister Molekit. His father, Flywhisker, didn't pay much attention to his kits, so Stormclaw, their mother, had to divide her time between them. Shadekit was always her favorite, so she devoted most of her attention to him. The others had to fight each other for their share of the rest of it. While Sootkit mostly (futilely) fought Shadekit for dominance, Ivykit and Molekit had a general agreement to share their mother's attention with each other. They were best friends growing up, and often played pranks on their brothers while being otherwise perfectly behaved. Ivykit was much more serious than his sister, although they were both calmer than their arrogant and hotheaded brothers. Despite how often all of them fought, they still remained friends and (mostly) friendly rivals. When it came time to be apprentices, Ivypaw was assigned to Thymepelt. Although lazy and not the most athletically inclined, he was otherwise a model apprentice behavior-wise. Shadepaw continued to be the favorite of the litter, as he was good at both hunting and fighting, but Molepaw showed a talent for tracking that gained her Stormclaw's approval. Sootpaw didn't have any particular skills, but he was handsome enough to cause several heads to turn. Despite all of this, Ivypaw established himself as the leader of their group due to being the smartest of them. He kept his siblings from getting in trouble in the first place whenever he could, but could help them with their problems even when they did have them. Due to his calm nature, he earned the name Ivycloud as a warrior. At the same time, his siblings were promoted, earning the names Molenose, Shadefang, and Sootface. He was a model warrior, and quickly proved himself to be one of the smarter in the clan. Beyond that, he had ambition, a drive to rise in ranks above his clanmates. Ivycloud wanted to prove himself to be once and for all the leader of his family. This quickly gained him an apprentice, Avocetpaw. He trained him expertly, and soon he became Avocetstream. After a few moons, he got a second apprentice, and trained her to become Hazelpelt. Both of them were model warriors, and both attributed this to their mentor. With this impressive history in mind, Ivycloud was training his third apprentice when he became deputy after Stoatnose, the previous deputy, retired. He finished off Whitepaw's education so that he could become Whiteclaw, even while dealing with the death of Sootface due to a fight with a rogue. About a moon after becoming deputy, Ivycloud got into another fight with a rogue. This time, he had climbed up into a tree to startle the cat that had tried to ambush his patrol. The cat ended up falling out of the tree, but not before she grabbed Ivycloud and dragged him down with her. Their fall was a nasty one, with Ivycloud's weight causing both of them to land wrong. The rogue hurt her back, and the rest of the patrol decided to give her a merciful death. Ivycloud was luckier, but his landing caused him to break both his foot and his tail. Even though he was safely escorted back to the camp, both healed wrong, leaving both to be permanently crooked. Despite this, he was determined to adjust to his new found limp and resume his duties as a deputy. Although he would never be as physically capable as he used to be, his intelligence was what had allowed him to become deputy in the first place, so he was deemed capable of resuming his duties. Due to this, his name was changed to Bentfoot, and he has been living as such ever since. Extra Notes: Let's combine name changes with deputies of shady moral character, shall we? Also, sorry for it not being finished, but I'm not going to have access to my computer for the next week, and I wanted to get this up so I could finish it on my phone. Looks nice so far! You always have great characters. Thanks. ^^ And don't worry, I will. I just needed to get this up before I left.